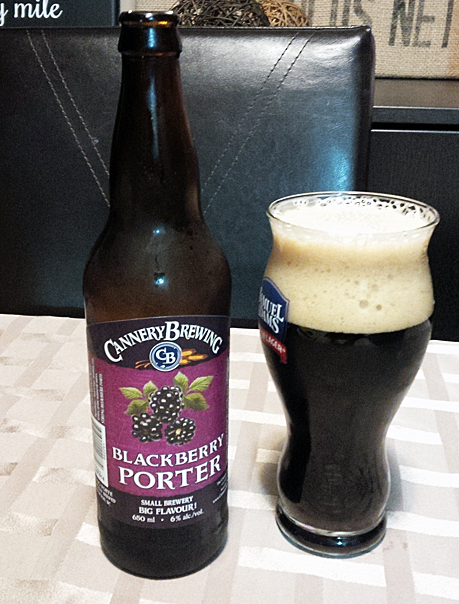 Cannery Brewing – Blackberry Porter: This BC Craft Beer is brewed in Penticton, BC at a strength of 6%, with 45 IBU’s and was poured into a 22 oz beer glass at home. Aroma and Appearance: It pours a dark reddish brown with 3 fingers of foam, no visible bubbles and has an aroma of smokey tart blackberries. Flavour: It starts with some smokey malt and dark chocolate, with a mild blackberry tartness in the middle and a dry coffee like bitter finish that leaves an aftertaste of blackberries on your palate. Overall Impression: This one pretty much does what you expect, combines a basic porter with real blackberry flavour in a reasonably balanced way. Rating: Personally, I give it an average rating of 5/10. Fruit beers are fairly hit and miss for me and this didn’t do anything for me. A lot of people love this offering, so please don’t let this rating deter you as it’s probably just me here. Food Pairing: This would pair well with smoked oysters or smokey bacon (like Beast and Brine’s double smoked bacon), that might bring out more interesting flavour. Did you end up liking this one?